This time of year in Florida, a marvelous sight awaits visitors to older neighborhoods. 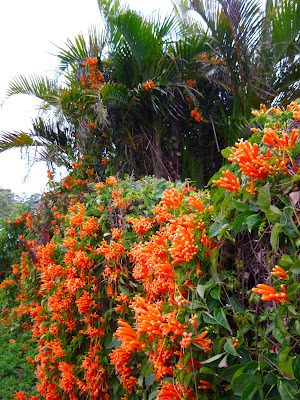 An old-fashioned creeper called Flame Vine (more info and photos here) brightens an otherwise drab winter landscape. It is gray and misting rain today, so thought I'd post a bit of color. I'm home with a grandchild, who, despite getting the proper 'shots' when an infant, has developed a case of the Chicken Pox. Hooray.....no school!!! We're having fun, playing games, doing art, making cookies - QUALITY Nana Time!! Sounds like you're having a super time! Brilliant photos of the Flame Vine, stunning colours!